Do you know what prevents most people from getting started with investing? The fear of choosing the wrong investment. This fear delays the decision to get started for weeks, months, and often even years. After all, when it comes to your hard-earned money, the last thing you want to do is see it vanish overnight because you chose the wrong place to put it. The second reason many people never get started investing is a lack of funds. When just starting out, you may only have a few hundred dollars to work with, but that can be a problem when many of the best low-cost investment options have minimum purchase requirements. These minimums can be anywhere from $500 to $3,000, and thatâs just to invest in a single fund. 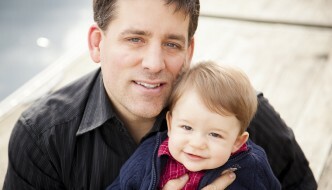 So, with these two major issues preventing new investors from getting started, it means a lot of missed opportunities. Thankfully, a relatively new company called Betterment has come to the rescue. 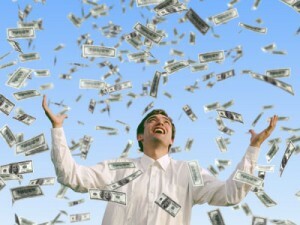 They have introduced a method of investing that is so easy thereâs no reason to stress over the decisions. On top of that, they have no minimum investment requirement, so you can get started even if you only have twenty bucks to get started with. 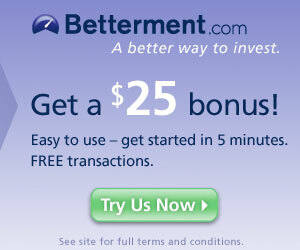 Here is a little more information about Betterment, how it works, and if it is right for you. 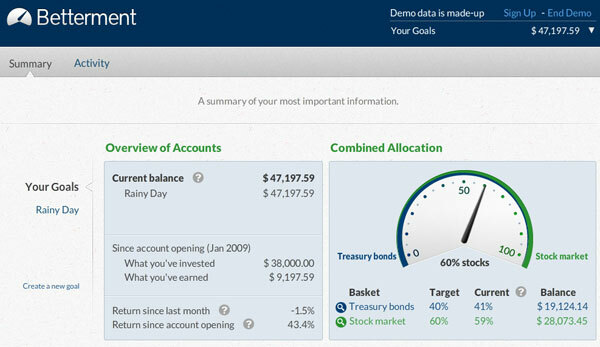 If you are familiar with online savings accounts, youâll be right at home with Betterment. Itâs basically a three part process: 1. Link up a bank account to Betterment. 2. Choose how you want to invest on an easy to understand risk scale. 3. Track your returns and withdraw funds at any time. Thatâs it. You donât have to go through a lengthy registration process like many brokerage accounts require, you donât have to wade through hundreds of investment options, or worry about hidden fees or transaction costs. Before moving on, letâs talk about the investment options work. The underlying investments are ETFs. If you arenât familiar with ETFs, hereâs a quick refresher. These are exchange traded funds, which means each fund typically tracks an index (such as the S&P 500) and then is traded on the major stock exchanges. These differ from traditional mutual and index funds which are not traded on an exchange and can only be bought or sold at the closing price set each day. Betterment creates portfolios tailored to a specific risk tolerance you set by combining ETFs that cover everything from treasury bonds to stocks. Obviously, the more risk youâre willing to take, the more of your money that is invested in stocks versus bonds. But rather than having to go out there and create a diversified portfolio of maybe a half-dozen ETFs on your own, Betterment does this for you. And the best part is you can do this even if you only invest ten dollars to start. In the real world, thereâs no possible way to invest in many different ETFs to get your target allocation without having hundreds of dollars available. Fractional Trading – Bettermentâs platform is dollar-based, not share- based, so it doesnât matter how much you have to invest. Diversified Every Penny â’ Through proprietary software, every penny is seamlessly reinvested. Rebalances Automatically â’ Betterment rebalances automatically every quarter, or when more than 5 percent from your target allocation. Goal Based â’ Betterment empowers you to invest toward specific, and multiple goals, with different allocations and advice for each. Dollar Cost Averaging â’ With the automatic deposit feature you can employ dollar cost averaging. Efficient and Liquid â’ Your Betterment portfolio is comprised of the most efficient ETFs and funds can be withdrawn at any time. Free Transactions â’ No trading costs. Deposit funds, change your allocation, and withdraw funds without any fees. I just want to touch on a few of those features to highlight how beneficial they are to investors. To start, the fractional trading is key because thatâs what allows you to get started with just ten dollars. Unlike saving up a few hundred or even thousands of dollars just to be able to invest in a single index fund elsewhere, you can get started with next to nothing. And rebalancing is very important. Iâve written about this before, but even seasoned investors get tripped up by not sticking to a rebalancing strategy. With Betterment you donât even have to worry about it because itâs done for you. And finally, one of the unique things is that you can allocate your money to specific goals and put real meaning behind that money. Itâs that kind of motivation that will really encourage you to keep on saving and investing. Ok, so weâve mentioned a few times that there arenât any fees, so whatâs the catch? Well, there isnât one really. Rather than nickel and diming you on transactions, maintaining an account minimum, and all of that, thereâs simply a fee built into your balance. Itâs exactly the same as the expense ratio youâd be paying on any ETF, index, or mutual fund. So with Betterment youâre simply paying an annual expense of between 0.3% and 0.9% annually, depending on your balance. To put that into perspective, if your account balance was around $1,000 for the entire year, youâd pay just nine dollars in expenses. And remember, thatâs what youâd pay regardless of how many times you traded, made deposits or withdrawals, rebalanced, etc. When just a single stock or ETF trade can run you between $5 to $10 you can see how expenses elsewhere can add up. But letâs be perfectly honest, savvy investors can obtain lower expenses by picking their own ETF and index funds and may be able to keep expenses down to between 0.1% and 0.5%. While that is possible, keep in mind that the few extra basis points youâre paying is allowing you to do things you canât do on your own, especially with limited funds. Youâre able to get instant diversification with as little as ten dollars, automatic rebalancing, fractional share investing, and even some advice about how to make the most of your money. The big question is whether or not Betterment is right for you. As just mentioned above, it is possible to find bare-bones funds and invest with lower expenses. So if you are already comfortable researching and picking out individual funds, and also have the money available to do so, then Betterment may not be as interesting of an option for you. But if youâve been putting off saving and investing for a long time because you arenât comfortable with all the options or donât already have hundreds or thousands saved and ready to invest, this is a no-brainer. Why keep kicking the can down the road and put it off when you can start with pocket change. Within five minutes you can have your account set up, linked to a bank account, and money deposited and invested. And since your money is completely liquid, you aren’t tying it up for any length of time and can move the money back into your bank account at any time. If you still aren’t sure, they are giving my readers one more incentive by providing a $25 bonus for signing up. That’s 25 bucks for doing something you should have done a long time ago anyway. So give them a shot and see if it is right for you.